CHICAGO – It’s time to laugh, and the Midwest Independent Film Festival has just the ticket. The 2018 Comedy Short Film Showcase – an annual event – screens on Tuesday May 1st, 2018. at the Landmark Century Centre Cinema in Chicago. The ten films include sneak previews and premieres, in film and TV shorts. For more information, including ticket purchasing and the list of short films, click here. 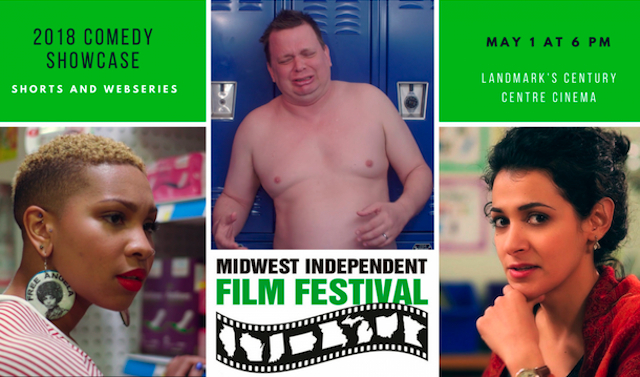 The Midwest Independent Film Festival presents the 2018 Comedy Short Film Showcase on Tuesday, May 1, 2018 (6pm start), at Landmark Century Centre Cinema, 2828 North Clark Street, Chicago. For more information about the festival, click here.